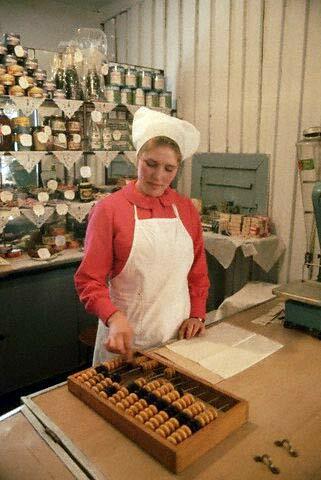 When I was growing up© there were 2 kinds of cooking oil: refined and unrefined sunflower oil. Until the 1970’s all the oil was unrefined, but eventually the more expensive refined oil was introduced to the Soviet People. Sunflower was the main source of cooking oil in the USSR which is amazing, considering that the sunflower plant is native to the North America, where it’s currently not nearly as popular. Olive oil was so rarely available that I don’t recall us ever having it at the house. The oil came to the store in giant metal 55 gallon drums, the hand-pump was installed on top so the oil could be dispensed. An oil-seeking customer had to bring his own jar or a bottle – the store couldn’t be bothered with the packaging. As a matter of fact, there were hardly any prepackaged foods at that time, store clerks weighed and wrapped everything to order, which contributed to the long lines. At the time the unrefined oil wasn’t my favorite because of its pronounced smell and taste of the roasted sunflower seeds, but a few years ago I tried a salad dressed with it and realized how much I missed that taste. 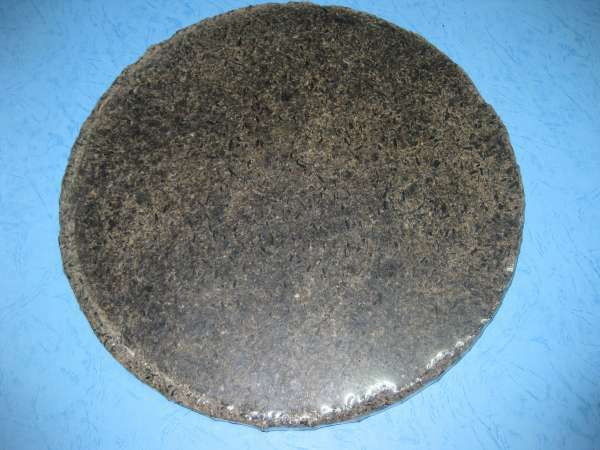 …and is normally used for feeding cattle. During the starvation years of the WWII it was considered a treat for the people and my parents recalled eating it in their younger ears. I tried it once, it’s just compressed sunflower seed shells and solids and it tastes accordingly. 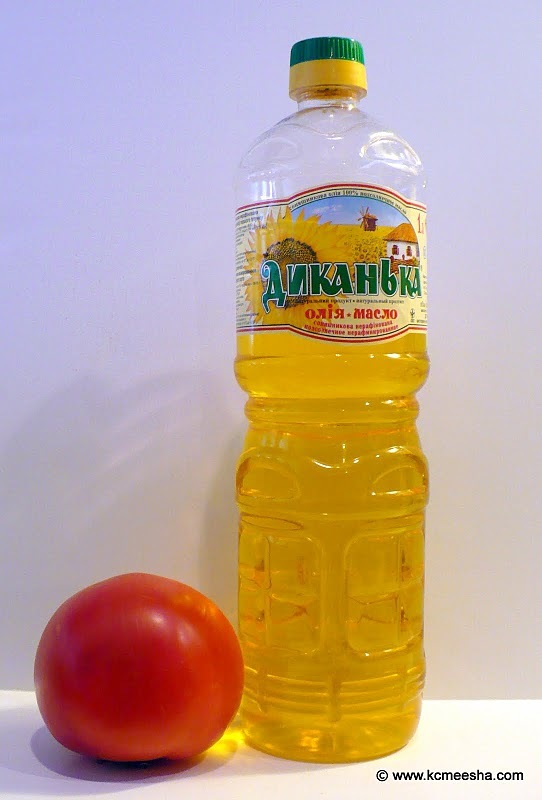 *tomato is for the illustration purposes only and does not come with oil. 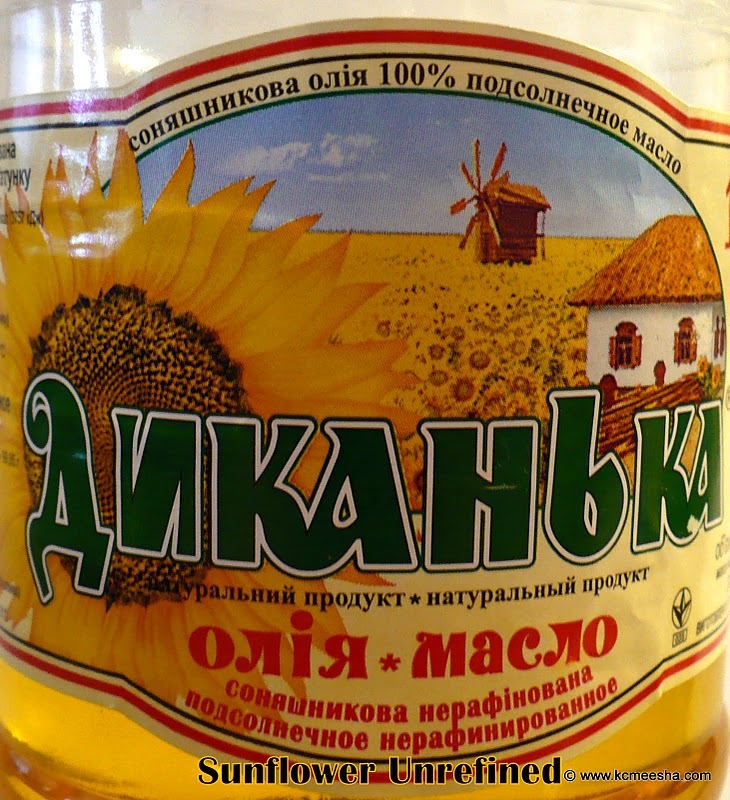 Locally the unrefined sunflower oil can be purchased at the Russian store (as much as I advertise for them anonymously I should never have to pay for anything there, ever!). Look for the similar words as I underlined on the bottom of this label “нерафинированное” which means “unrefined”. There is usually an English label as well, but the one I have didn’t say if it was unrefined. Refined oil has no taste, so there is no point of making a trip to get it there. 1 liter bottle is $4.19. This oil is good on salads as well as for cooking; pan-fried potatoes are my favorite. However, I want to emphasize that it has a fairly strong smell and taste, which may be too much for some people, but if you don’t mind extra virgin olive oil you shouldn’t have a problem with the sunflower oil either. On your trip to the Russian store make sure to pick up some smoked fish, a jar of pickled tomatoes and, of course, some candy. *photo of the Soviet store was taken here.